A magic set that will turn you into a magician! This amazing set has everything you could possibly need to become a wonderful magician. All you need to provide is a sense of adventure, and before long you'll be performing tricks like a pro. There are over 200 tricks to learn, using the included props as well as everyday household items, and there's an illustrated instructional booklet as well as an instructional DVD with easy steps to follow. Whether you're floating in front of your friends with the Levitrix Box, magically producing candy with the Infinity Machine, or even mysteriously printing real money with the Money Machine, this set will have you performing true feats of wonder. So unleash your inner Houdini and get ready to stun all your friends with the Fantasma Break Thru Magic Set! Parlour Deck UNMARKED (RED) Phoenix backs (3 x 4" / 7,5 x 10 cm). 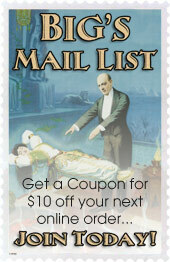 Click the button below to add the Break Thru Magic Set by Fantasma Magic - Trick to your wish list.